24 Sep 2014: SEQ: Can we please see out of and into buses, trains and trams! Re: 24 Sep 2014: SEQ: Can we please see out of and into buses, trains and trams! There are significant problems with ad-wrap on buses, trains, ferries and trams blocking windows vision. Public transport vehicles are built with windows for a reason, so passengers and others can see into and out of them. Public transport vehicles are not built window-less are they? The windows should not be blocked. This is very disorientating for passengers, particularly at night and/or when wet, and also makes it very difficult if not impossible to see into the vehicle. The blocking of window vision could have very serious safety and security implications as well.
" Advertising on windows of buses, trains and trams betrays a prejudice that those outside the vehicle are more important than those inside. It’s insulting. And to make it worse, when you object, the response is so often “But they’re transparent”. No, they’re not." Advertising on windows of buses, trains and trams betrays a prejudice that those outside the vehicle are more important than those inside. And to make it worse, when you object, the response is so often “But they’re transparent”. No, they’re not. We agree strongly. It is a sign of disrespect and contempt for public transport passengers to block their vision by covering up windows with ad-wrap. Time to get rid of it. Advertisements can still be placed on public transport vehicles preserving the revenue, but leave the windows clear please! have the windows blocked with ad-wrap. So there are health impacts to consider as well. I am confident there would be other individuals with PTSD etc. that would also have difficulties. But seriously, why do they turn public transport vehicles into tin cans? They are built with windows for a reason. Residents draw to the attention of the Lord Mayor, problems with visibility and safety caused by advertising covering bus windows. Your petitioners therefore request that BCC discontinues the practice of covering bus windows with advertising wraps. In the current financial year, Council expects to provide a Public Transport Operating Subsidy of $126.5 million, which supports the operation of quality bus and ferry services across the city and suburbs. Revenue from advertising on buses assists Council in providing this high level of funding support for public transport. Without advertising revenue, Council would need to consider reducing public transport service levels or increasing general rates to fill any funding gap. It is important to note, however, that Council already takes steps to ensure that external advertising on buses does not unreasonably impact on passengers. Council currently has more than 1,200 buses in its bus fleet, however, relatively few buses have advertising that fully covers windows. The most common form of external commercial advertising used is a Portrait Side display, which is a 1.4 metre wide advertisement positioned on the side of a 12.5 metre-long bus. Council also makes use of the rear of its bus fleet, which is generally window-free, for advertising purposes. The number of fully-wrapped buses represents only five percent of the entire fleet. The majority of these wraps are used for Council and community purposes, including to identify the iconic Blue and Maroon CityGlider services, the Spring Hill Free Loop, commemorating the Centenary of Anzac Day and to promote the 2019 INAS Global Games. The wrap used on Blue CityGlider buses has recently been updated and refreshed to allow improved passenger visibility, with significantly less window coverage. Council is currently reviewing the wrap being used on the Maroon CityGlider buses and will initiate a similar update program commencing in 2019. Council acknowledges that some passengers may have concerns about visibility from bus windows. At present, the material being used for bus advertising is perforated, with hundreds of pin holes allowing passengers to be able to see through the artwork. The product being used is the only commercially available product which meets the Australian Design Standards. The product is used by a number of different transport agencies throughout Australia and around the world. Therefore, Council does not support the removal of advertising from Council bus windows at this time. Garbage response. If the majority of fully wrapped vehicles are vanity projects only, then the imposition on the public is not bringing in any money to justify it (which itself is a paper thin excuse - note they don't say how much the advertising actually brings in, and what proportion is attributable to wraps). I would like to point out that there were almost buses with ads covering the windows at all. The only ads are down the sides of the bus, below the windows and on the backs. Can't see why this is too much of a stretch for BCC. Changes to all over wrap for the Glider service. What's more newsworthy out of the above is that the Cityglider fleet is itself being renewed with the newest deliveries to replace the more clapped out articles current assigned to the route. Which in turn those clapped out vehicles currently on the Cityglider route are replacing their older gas powered brothers earmarked for transfer over to GC to replace the even older gas Scanias fleet currently in the process of being phased out/withdrawn from service. Deputy Mayor Adrian Schrinner has announced a new updated wrap for the Blue CityGlider. We are particularly pleased that Cr Schrinner and Transport for Brisbane have taken note of feedback concerning the loss of window visibility with all over ad-wraps over windows of public transport vehicles. The new wrap does provide much better visibility into and out of the buses, for us an important point. Thanks. Can we please see out of and into buses, trains, ferries and trams! 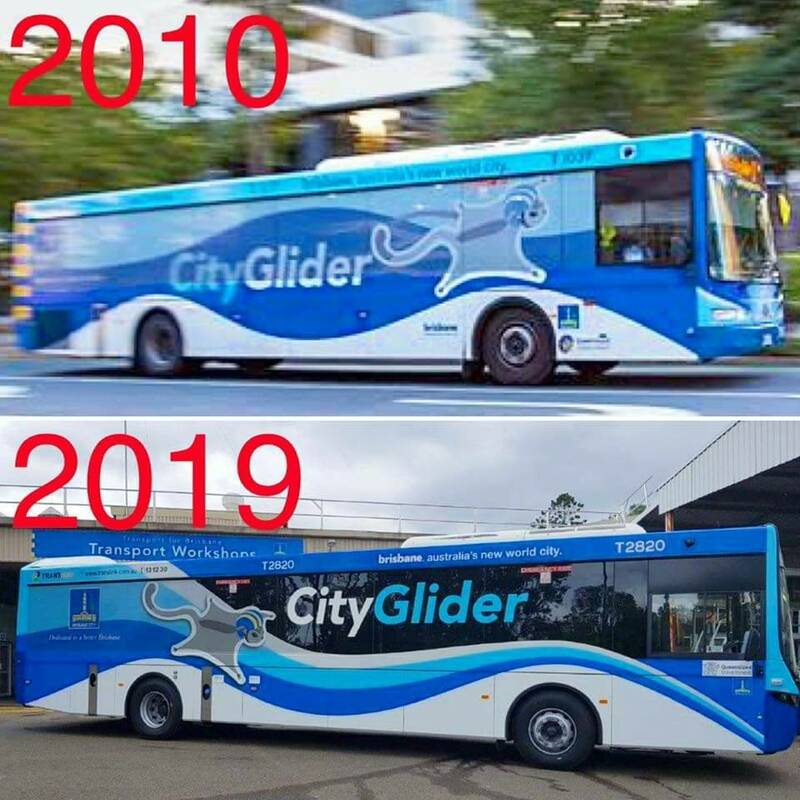 While acknowledging the sensible improvement in the visibility of the new wrap for the Blue CityGlider there continues to be a problem with windows of public transport vehicles generally, be they buses, trains, ferries or trams being blocked by advertising material. Authorities say the wrap complies with this standard and so forth, but fact is even the compliant wraps block vision into and out of the public transport vehicles, and it becomes even more obstructed in inclement weather and in poor light conditions. This can be very disorientating for passengers and we believe is a safety risk. Public transport vehicles are constructed with windows for a reason - specifically to allow people to see into and out of the vehicles. They are not constructed as window-less submarine like vehicles, so why make them like that by obliterating visibility through windows? There is no reason why windows of trains should be blocked at all. There is plenty of non window area for advertising wraps and the like. Buses should have at least 80% of the windows clear in our view, similarly trams and ferries. It is time the transport authorities followed the lead of Transport for Brisbane and started treating their passengers with courtesy. Please clean up the windows on ALL public transport vehicles. We have no objection to advertising material on the body of vehicles away from windows. Media release 24th September 2014 SEQ: Can we please see out of and into buses, trains, ferries and trams! Facebook, very strong response in a short time .. Lot of interest in ad-wrap blocking windows! Page created in 0.049 seconds with 24 queries.